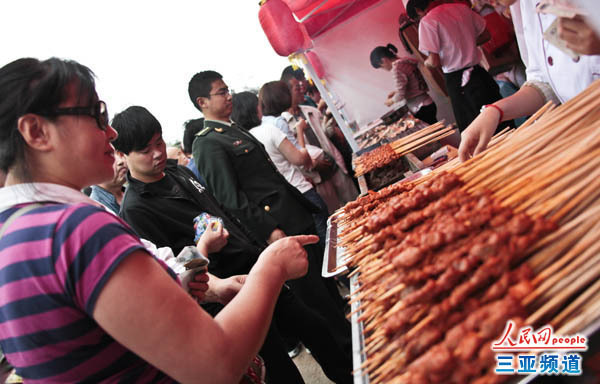 The 2011 3rd Sanya International Food Festival was kicked off Tuesday afternoon at Dadonghai Square. The festival, held from 27th to 31st Dec, is one of the main activities in the Sanya sub-venue for the 12th Hainan Carnival Festival scheduled to be held on 30th – 31st Dec at Wanning City. The 5-day food festival has attracted 70 exhibitors such as star-rated hotels, renowned restaurants as well as well-known snack shops to display their delicately selected dishes to benefit visitors. Thanks to the opening of Sanya-Taiwan direct flights this year, it is the first time for Taiwan’s exhibitors to bring their Taiwan snacks to Sanya. Besides, a range of themed activities including tourism cuisine forum, top 100 restaurants selection and music and dance performances are held in this year’s festival in order to promote the food culture.